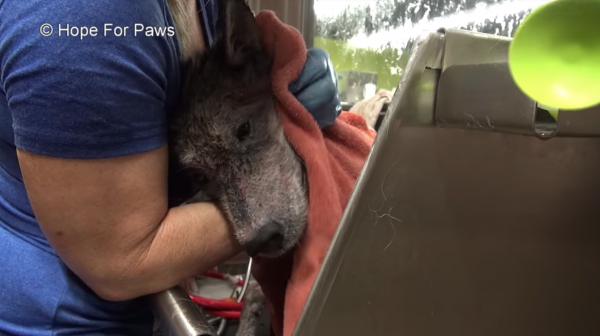 One day, rescuers from Hope for Paws responded to a text message about a “wolf” walking down a street in Los Angeles. 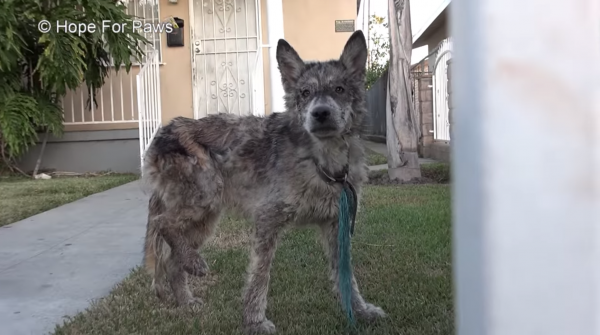 When rescuers arrived at the scene, they noticed the “wolf” inside a gated house. 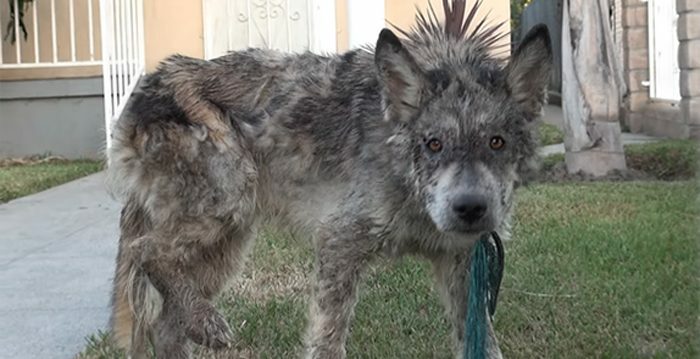 Thinking the creature with disheveled fur was a wolf, rescuer Lisa Chiarelli immediately closed the gate. However, after observation, they found the animal to be gentle and non-threatening. They thought she might be a wolf-dog hybrid instead. 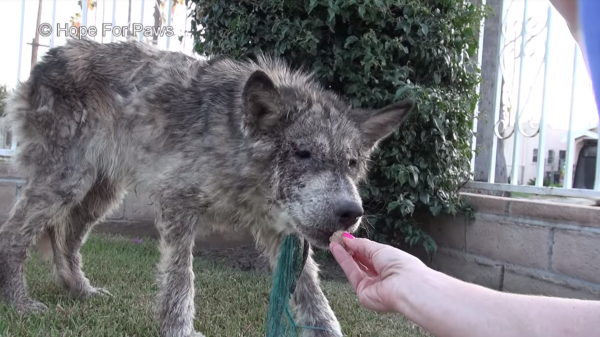 The stray dog, which they later named Julia, gently accepted the food offered to her. Chiarelli carefully placed the leash around the dog. Julia was clearly in pain when she walked with a limp into the rescuers’ car. Julia was taken to a veterinary clinic right away, where she was found to be suffering from mange, bacterial infections, and malnutrition. Covered with infections, her skin was bleeding and had pus oozing out everywhere. “Julia’s paws were so swollen, her nails were so long…,” wrote Hagar. 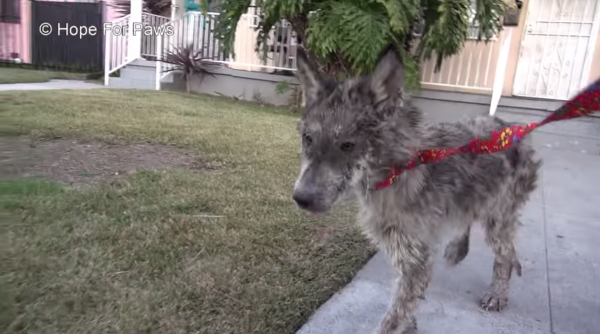 The neglected stray was given special baths and medication to treat her wounds. “When we got the water running, we noticed right away how skinny she was,” Hagar wrote. Poor Julia was bleeding all over when the water hit her skin and broke her scabs. The emaciated Julia simply rested her head on Chiarelli’s arm. After grooming, Julia began to look a little less wolf-like and more like a dog. She then slept on a warm bed, probably for the first time in her life. With lots of rest, coupled with tender loving care, Julia slowly regained her energy. She began to wag her tail for the first time! As Julia got better, she was placed in a foster home. In her new foster home, she had two other dogs to play with. So, is Julia a wolf-dog hybrid? No. According to DNA results, Julia is actually a 2-year-old German shepherd-Siberian husky mix! Soon, Julia found a new forever home with the Snook family thanks to ART N’ Paws, a local animal rescue. Finally, she’s now receiving the love she deserves, and doesn’t need to roam the streets for food again. Just look at Julia’s incredible transformation!